I’m not sure if I can call my vegetable fritters “fritters” as I make mine without any flour - like these carrot and soybean fritters. As well as having a thing about sugar in savoury food, I have another thing about flour in fritters. I don’t add any breadcrumbs either, which means that my fritters are a little bit tricky to turn over. They taste sensational though. Using cooked and mashed edamame beans, immature green soya beans (soybeans), adds a lot of protein and soluble dietary fibre to the fritters. You’ll find soya beans in the frozen section in supermarkets. If you fry fritters in a frying pan you will have to use a fair bit of oil. I prefer to place mine on a baking tray covered with baking parchment and cook them in a relatively hot oven. Not only is this a much healthier and fat-free way of cooking, it’s a lot less messy. And I am still calling them fritters! I serve mine with oven-roasted tomatoes and onions. 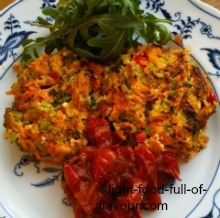 Add a mixed salad to the carrot and soybean fritters and this will make for a light and healthy lunch or dinner. 1. Preheat the oven to 220C/Fan 200C/425F/gas mark 7. Mix together the tomatoes, onion, oil and balsamic vinegar in a roasting pan. Season with salt and pepper and roast in the oven until the tomatoes start to blister (around 30 minutes). Give the mixture a stir mid-way through. 2. Cover a baking tray with baking parchment. In a bowl, mix together all the ingredients for the fritters. Season with salt and pepper and mix thoroughly. Divide the mixture with a large spoon into 8 portions on the baking tray. 3. Place the baking tray in the oven and cook the fritters for 4 minutes. Take the tray out of the oven and using two turners, or large spoons, carefully turn over the fritters. Don’t fret if they fall apart a bit, they are easy to reshape with the utensils you are using. Place the tray back into the oven and cook for a further 3-4 minutes – until the fritters start to brown nicely. Serve the carrot and soybean fritters with the oven-roasted tomatoes and a salad.